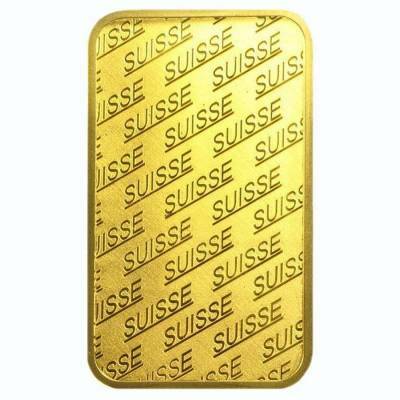 This newly designed 1 oz Gold Bar - PAMP Suisse - New Design is a wonderful gold piece. 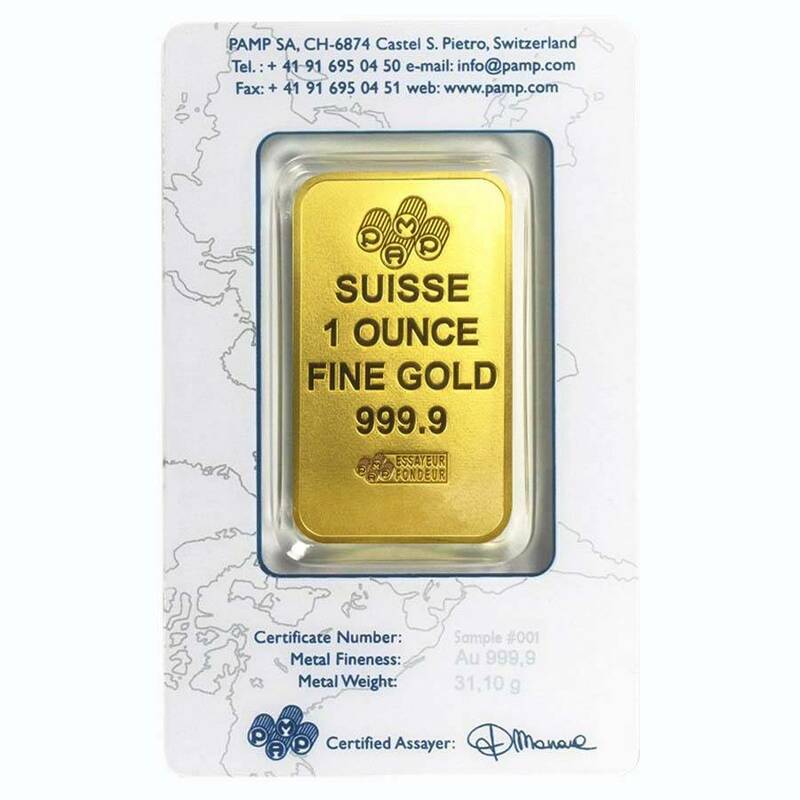 This stunning .9999 fine gold bar captures the remarkable beauty and quality which PAMP Suisse is known for. 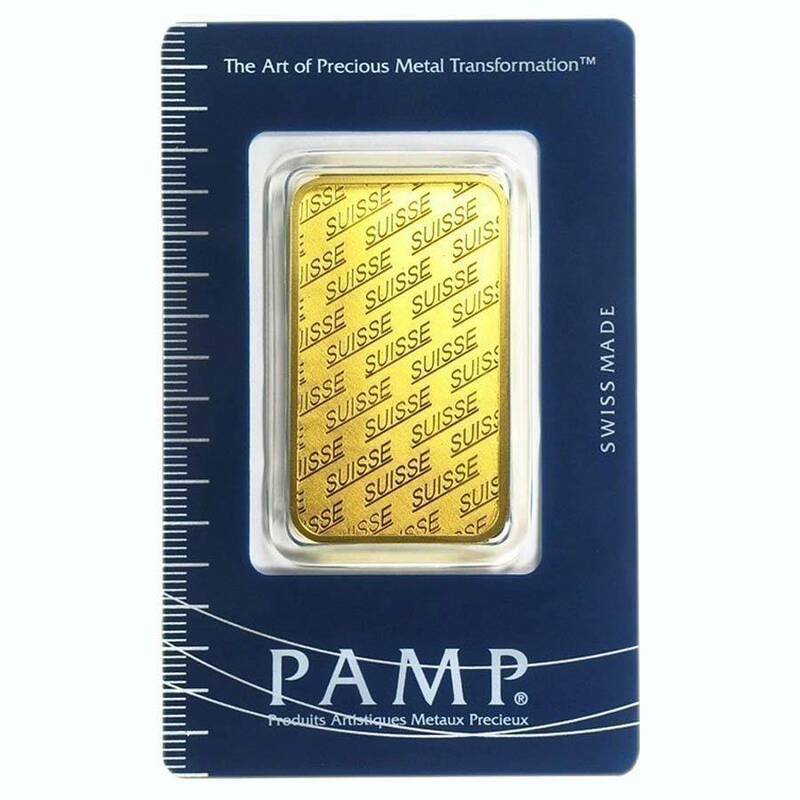 As a leading Precious Metals refiner, PAMP Suisse guarantees the purity and authenticity of each Gold bar. The gold bar has been the most popular precious metal product throughout the history of human civilization. 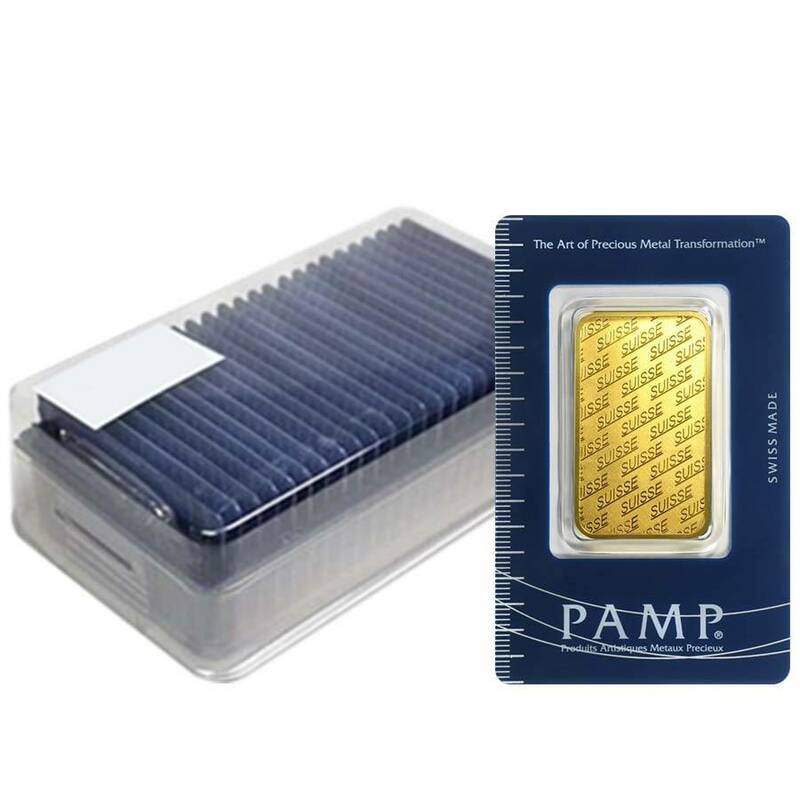 Today, gold bars are coveted by investors and collectors for their inherent value and impressive designs. 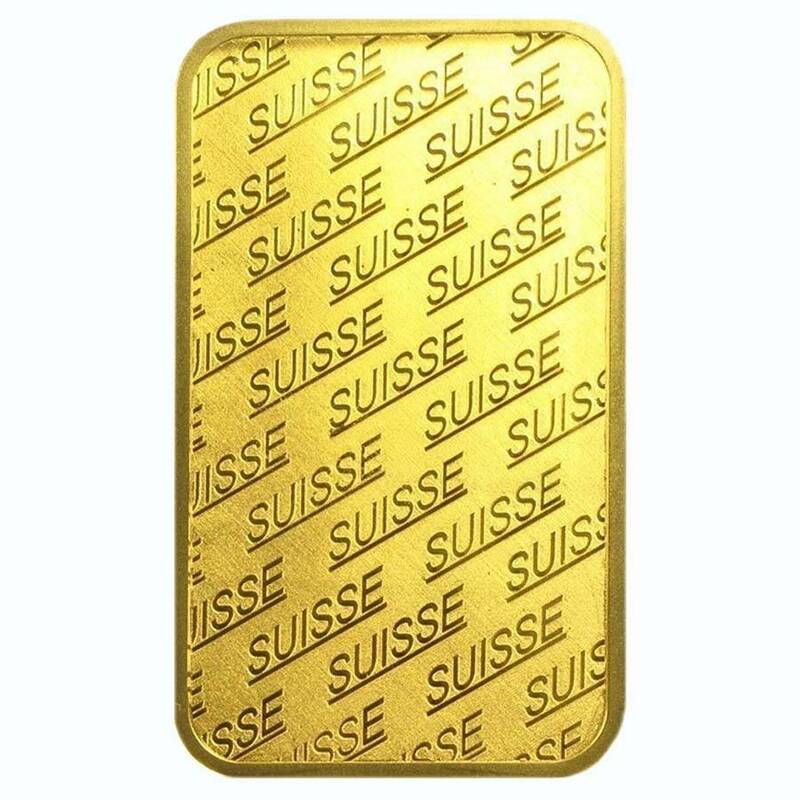 The reverse features the PAMP Suisse logo at the top of the bar’s design. 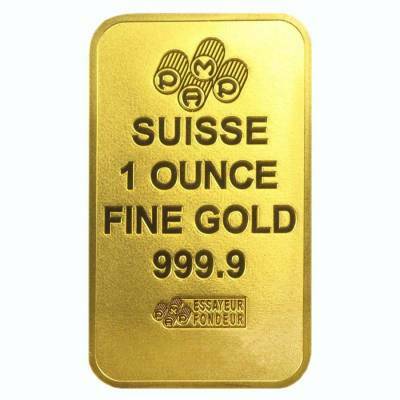 The word “PAMP” is split into four circles, with each circular tube containing one of the four letters “PAMP.” Below that are engravings of “Suisse,” “1 Ounce,” “Fine Gold,” and “999.9” The bar’s individual serial number and assayer’s mark are also engraved on this face. 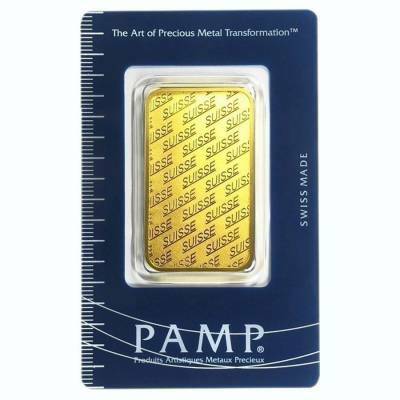 Each 1 oz PAMP Suisse Gold Bar is packaged in an Assay card. The assay card allows you to authenticate the serial number, weight, and purity of your bar with ease. Made from .9999 fine gold with a weight of 1 troy oz. An Assay card guarantees the Gold metal weight and purity. Tamper-evident packaging makes it easy to tell if the bar has been questionably handled, further ensuring its authenticity. Obverse: The word "Suisse" appears in a repeating diagonal pattern. Reverse: Depicts the PAMP Suisse logo, weight, and purity, along with a unique serial number. 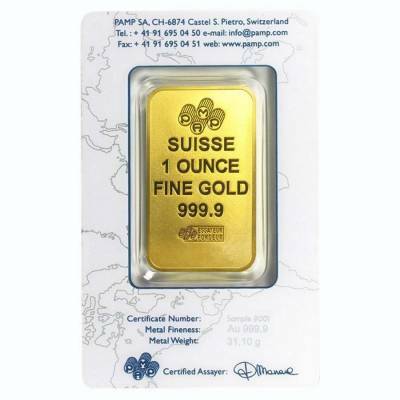 With Bullion Exchanges, you can be sure you will find only high-quality bullion with iconic designs. Pick this wonderful 1 oz Gold Bar - PAMP Suisse - New Design today with our simple online ordering system. If you have any questions, call us by phone at 800.852.6884 or write us a message, we will happily assist you. I have made several purchases with Bullionexchanges and have been very satisfied with the products I've purchased. When I've had a question you get a real person to answer it. Good prices and quick service. 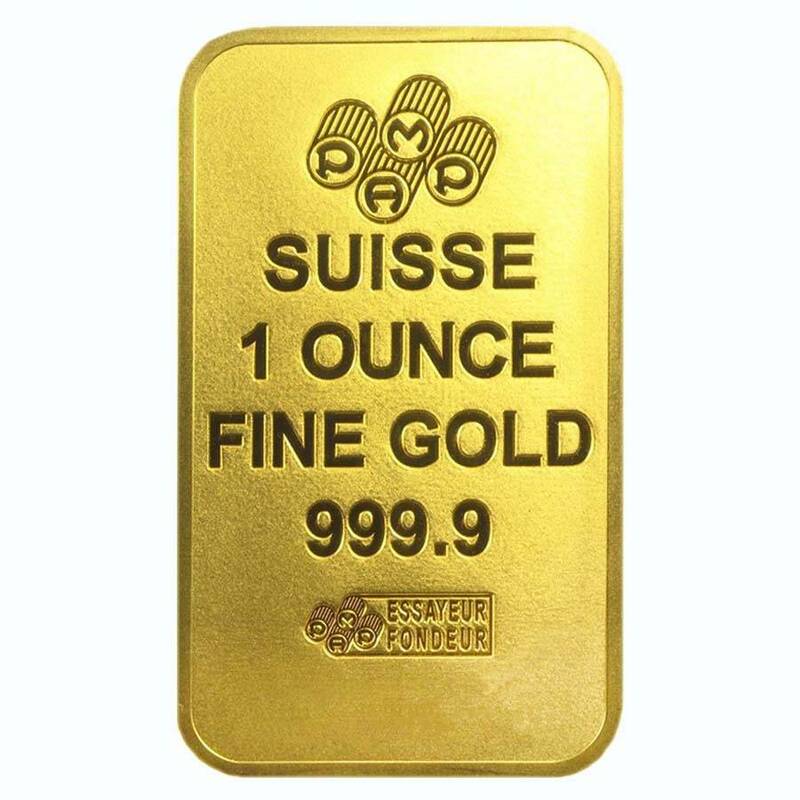 If you want Gold bars go to Bullionexchanges. 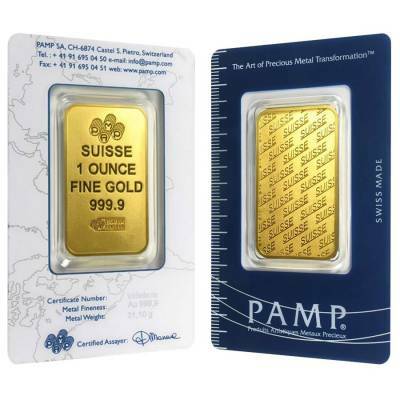 I got my 1 oz PAMP Suisse - New Design Gold Bar in just a few days after my order and in perfect condition. The prices on Bullion Exchanges' website were super low compared to companies like JM Bullion. Happy to buy from them again. I called Bullion Exchanges to ask a few questions before taking the leap into investing in gold. I spoke to a very knowledgeable representative who answered all of my questions very clearly, and in a kind and professional matter. I read their Gold Blog posts which inspired me to do more research, and after my call with Bullion Exchanges I was confident in my choice to both buy Gold and do business with Bullion Exchanges. They helped me create my account, and placed my order for me. My gold bar arrived today, just 2 days after placing my order. Its even more beautiful than I expected! I am so happy, thanks B.E.! I called and asked for the same rep I spoke to only to find out the kind rep was one of the owners! Have made many purchases from Bullion Exchanges,always good value and prompt shipping!!! With this purchase, you earn 1304 Bullionaire Bucks 1304 BB = $1.30. We currently have 486 of this item in stock.